More from Cartoon Brew: They have a first look at Okami kodomo no ame to yuki, a new 2D anime feature directed by Mamoru Hosoda. The title translates as The Wolf Children Ame and Yuki. 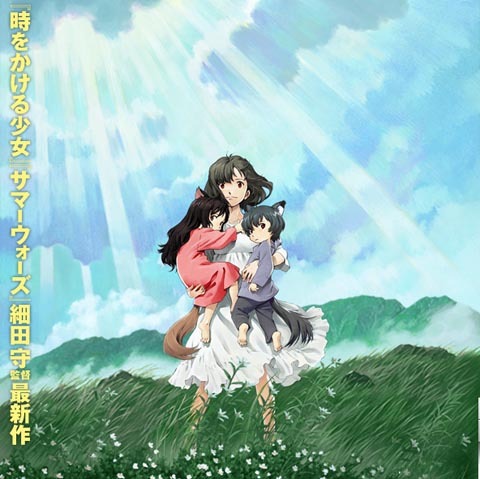 Here’s the basic press release: “From the director of The Girl Who Leapt Through Time and Summer Wars, the story of a college student named Hana who marries a ‘wolf man’ and gives birth to two wolf children. When the wolf man dies, Hana and the children move from the city to a quiet rural town.” The film is being distributed by TOHO Studios, and it’s set for release (at least in Japan) this July. There’s not much yet on the film’s web site (and what’s there is in Japanese), but they’ll add to it as the year goes along.